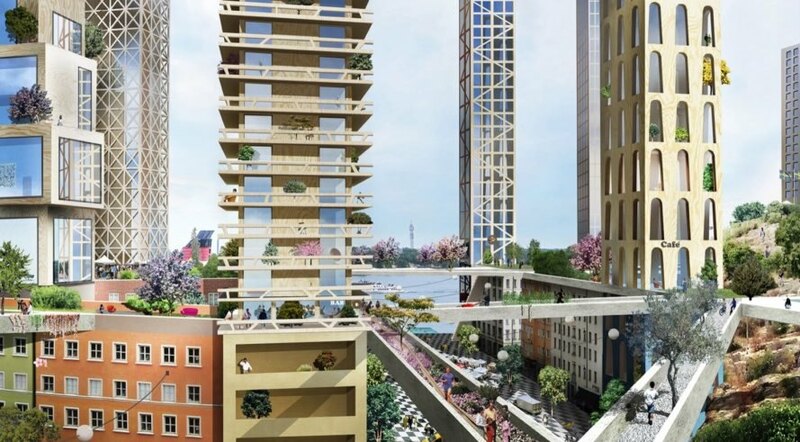 When Anders Berensson Architects was tapped by the Stockholm Center Party to design a new Stockholm neighborhood that would be the densest, tallest and most environmentally friendly in the city, the Swedish architecture firm responded with Masthamnen, a skinny timber “skyscraper city” elevated atop traditional city blocks. The mixed-use proposal includes a combination of residential, office and retail spaces in a pedestrian-friendly environment integrated with public parkland that connects the new district with the surrounding hilly landscape and urban fabric. Located in a valley between three hills, Masthamnen is organized into three main parts: a lower block city on the same level as today’s dock levels; an elevated timber “skyscraper city” on top; and a series of landscaped roofs and bridges that link the development to the hilly terrain. The lower section would comprise 19 new city blocks ranging from six to 10 floors. In total, these blocks would contain 2,500 apartments, 60,000 square meters of office space and nearly 100 shops and restaurants. The wooden skyscraper city elevated atop these blocks would consist of 31 new skinny wooden skyscrapers ranging between 25 and 35 floors to include approximately 3,000 apartments with an estimated 30 shops and restaurants. Views are prioritized in the design and layout, and each skyscraper is given sufficient clearance to avoid obstructing views. 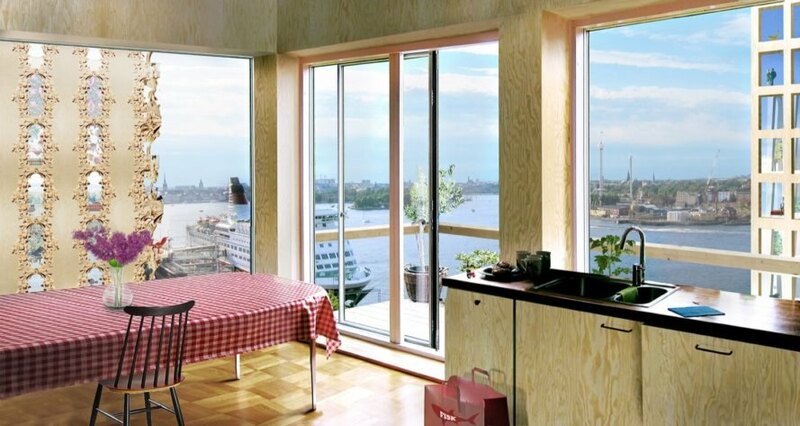 Cross-laminated timber would be used as the primarily building material. Anders Berensson Architects have designed a wooden skyscraper city for an eco-friendly Stockholm neighborhood. Called Masthamnen, the skyscraper city will involve topping traditional city structures with CLT skyscrapers. The project is planned for a pedestrian- and environmentally friendly area. The towers will house a mix of residential, office and retail spaces. 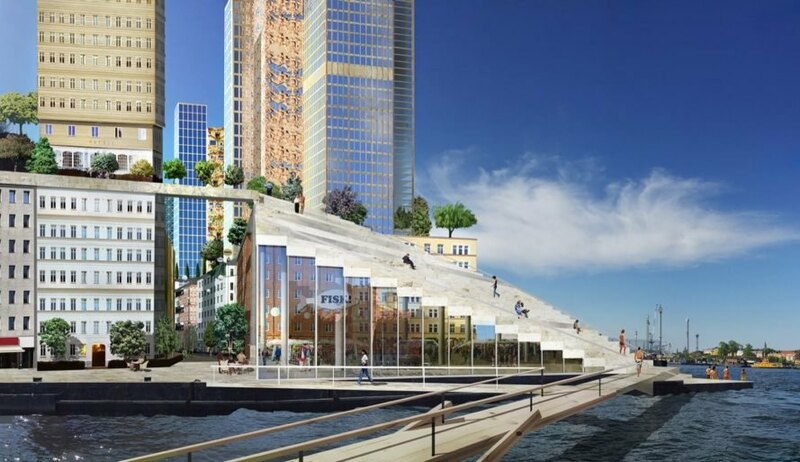 The skyscraper city is proposed for a valley between three hills in Stockholm. The development will bring thousands of apartments and more than 100 shops and restaurants in total. Each structure is carefully designed so that views are obstructed for no one. The new towers will rest atop existing structures.